he couple, arrested earlier this week on charges of torture and child endangerment, could face up to life in prison if found guilty. The couple pleaded not guilty on Thursday to multiple counts of torture. David Allen Turpin, 57, and his wife Louise Anna Turpin, 49 appeared calm as they pleaded not-guilty. Parents accused of holding their 13 children captive, some of them shackled to the furniture with chains and padlocks, were charged with torture and child abuse Thursday, days after a 17-year-old escaped and led police to the Southern California house. David Allen Turpin and Louise Anna Turpin face multiple felony counts of torture, child abuse, abuse of dependent adults and false imprisonment. David Turpin is additionally charged with committing a lewd act on a child by force. The couple, arrested earlier this week on charges of torture and child endangerment, could face up to life in prison if found guilty. The couple pleaded not guilty on Thursday to multiple counts of torture. "As a prosecutor there are some cases that haunt you," Riverside County District Attorney Michael Hestrin said at a news conference Thursday. "Some deal with human depravity, and that's what we're dealing with here." The 13 siblings, ranging in age from 2 to 29, underwent years of abuse and starvation at the Turpins' home in Perris, California, authorities say. The couple was arrested after a 17-year-old girl escaped Sunday from the home, near Los Angeles, and dialed 911 on a deactivated cellphone, according to police. She had been trying to escape for two years, Hestrin said. Hestrin gave the first detailed police account of the siblings' condition and treatment Thursday. They were forced to sleep during the day and would stay up at night. Some were chained to their beds. The parents would buy food for themselves but prohibit the children from having any, with the exception of the 2-year-old, who was getting enough to eat. Toys found sitting in the house were unopened. The children were almost completely barred from bathing. If they washed their hands above their wrists, they would be chained up as punishment for playing with water. None have been to a dentist and they had not seen a doctor in four years, Hestrin said. What the children were allowed to do was write in journals, hundreds of which are being examined by police. The abuse began when the family lived in Fort Worth, Texas, Hestrin said. The parents lived apart and would deliver food to the children from time to time. The parents at first tied the children to their beds with ropes, Hestrin said, but began using padlocks and chains after one of them was able to break the rope. The siblings are being treated at Riverside University Health System Medical Center for extreme malnourishment. Medical experts said they expect that the children will require long-term psychological support in their recovery. 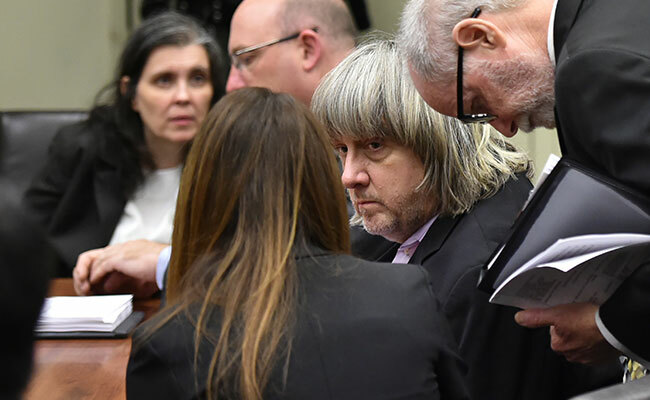 Earlier this week, authorities said David and Louise Turpin were "unable to immediately provide a logical reason" why the children were shackled and chained and that Louise Turpin seemed "perplexed" by the investigators' questions.